Easily load and unload your haul. 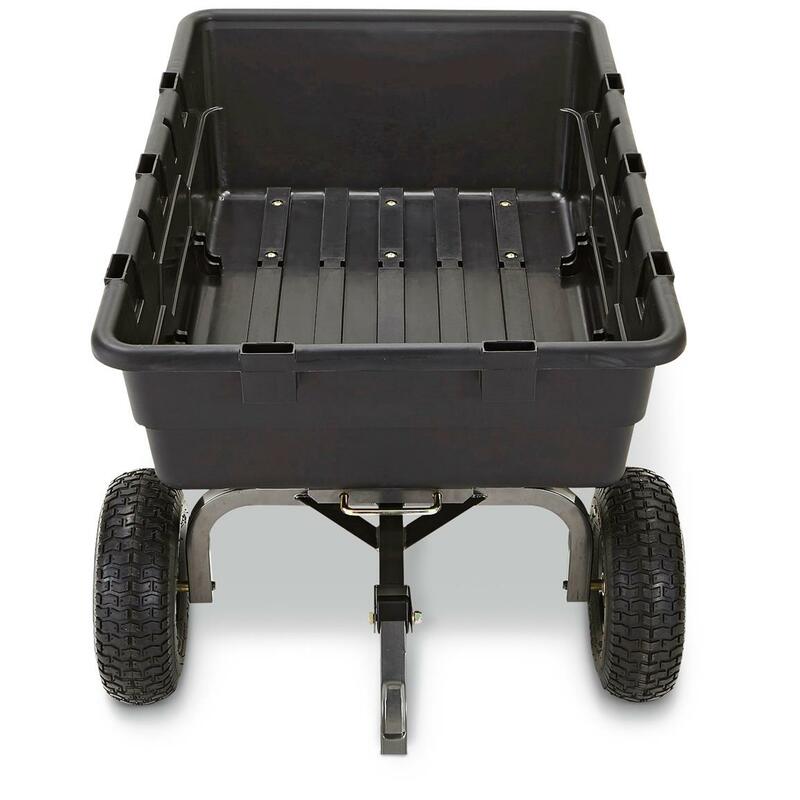 With the patented quick-release dumping system, this newly designed Poly Garden Cart allows you to load and unload with ease. The frame is powder-coated steel providing a greater level of durability. The bed is constructed of a maintenance-free polymer, making it a breeze to clean. 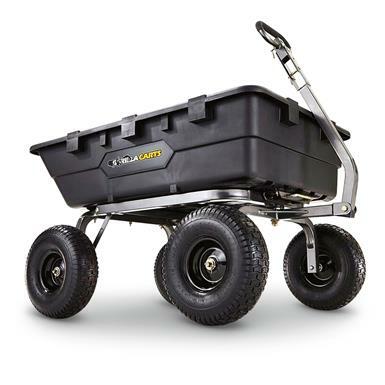 The 4-wheel design always keeps your haul balanced and it's more stable than a standard wheelbarrow. It doesn't matter if you're hauling through mulch, dirt, gravel or plants, the 15" pneumatic tires roll on without a moments hesitation. 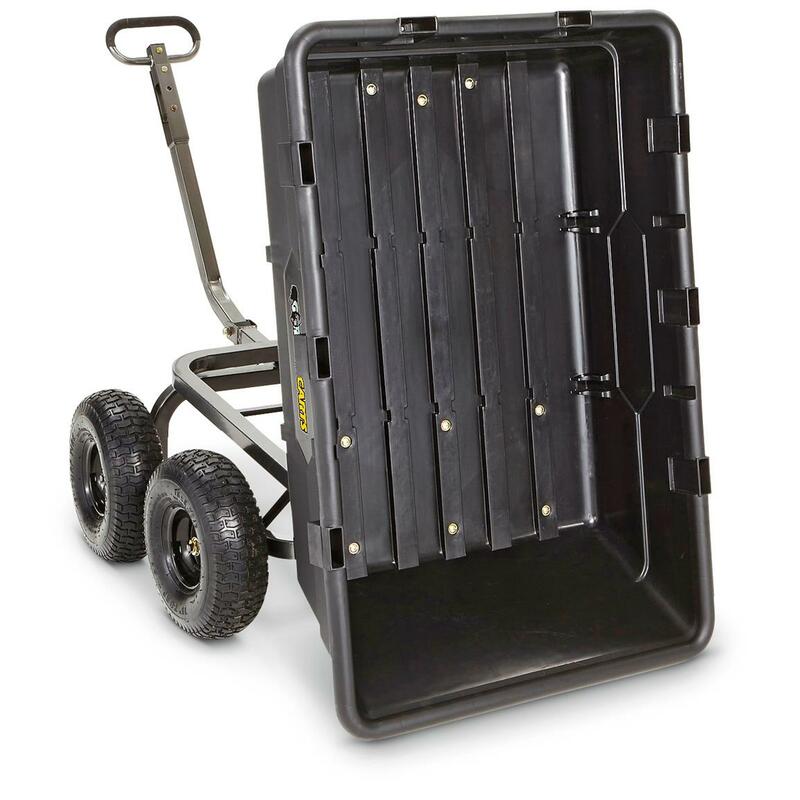 From the casual gardener to the lawn professional, the Poly Garden Cart has your haulin' covered at home, on the farm, or in the garden. It's all in the handle. 1,500 lbs. can be a daunting amount to pull. We completely agree. Even on 4 pneumatic wheels with dry pavement, it may be difficult. Gorilla Carts has thought of this and has you covered...with a morphing handle. The handle of the Poly Garden Cart may look like your standard handle, but it has a hidden secret. In a matter of seconds, you can convert the handle into a hook-up for your lawn tractor. 1,500 lbs. suddenly got a lot easier to move, when you hook it up to a machine, that is. When you're finished towing your load to your desired location, simply unhook it and convert it back to a handle. Surprise your wife with your outstanding strength. Haul this Cart away today! 55.2" x 32.5" x 30.2"h.
Capacity: 1,500 lbs. / 10 cu. ft.